Arthur Sayler of Albert is a post rock cutter. 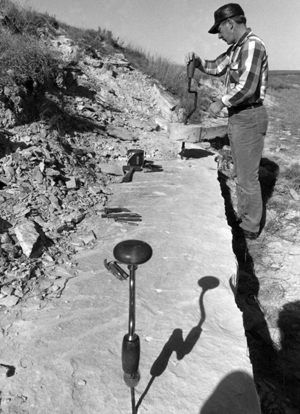 He is one of a handful of men in central Kansas who continue to practice the traditional art of cutting the native limestone. Although the practice of using stone as a building material is in no way unique to Kansas, there may be no other region in the world that can claim a specific type of limestone that has been used so extensively for fence posts. Arthur Sayler was born in 1907 within two miles of where he now lives. when he was married in 1932 he and his wife moved to the farm they continue to occupy in Barton country. Although they do not own it all, today he and his son farm approximately 1,100 acres. their major crop is wheat. although he calls himself a farmer, Arthur proudly says, "I just thank the Lord I learned to do everything." Arthur's first memory of post rock cutting was when his father decided he wanted a stone water tank. The family already had other structures made from limestone, such as pig and chicken troughs. In order to build the water tank the Saylers enlisted the help of a neighbor by the name of Jon Maneth who helped them quarry the stone and build the water tank. Arthur recalls, "I learned a lot from him." Arthur's interest in the native stone grew and he became an apprentice to a man named Bob Pfister from Pawnee Rock. By this time the public's interest in the stone fence posts had declined but there was still plenty of work to be found repairing and building structures and adding fireplaces to homes. Arthur was motivated to learn to work with the stone at a time when very few young people showed much interest in the tradition. "I just had pride enough," he explains, "thinking we dare not do away with the rocks. They should be put right back again." In back of Arthur's house is a beautiful stone building he brought onto the property in the 1940s. Although Arthur has had a few stone corner posts on his property ever since he can remember, he recently decided he needed a whole fence. So, with the help of their son and neighbors, the Saylers erected a post rock fence around the front of the farm. In 1987 Arthur participated in the Folk Arts Apprenticeship Program taking on Larry Rutter of Meriden as his apprentice. Larry is a native Kansan who grew up on a small farm in the northeastern part of the state. He first became interested in post rock while working in the oil fields of central Kansas in the early 1960s. Although he always had been impressed with stone as a building material he found the fence posts of central Kansas to be unique and they began "to grow on" him. Larry is a little in awe of these posts, explaining, "They have a sturdiness or a stability about them—they are something that will last a long time." Since Larry's wife is from central Kansas the family has had many occasions to return to the land of the post rock. Shortly before meeting Arthur, Larry began to work with the stone himself. He points out that although the post rock is unique to central Kansas he was most familiar with the stonework found in his own part of Kansas, the Flint Hills. Larry began working with stone for personal enjoyment. "My own heritage, my people were all farmers," he explains. "I love to work with my hands." In the early part of this decade Larry decided he wanted to landscape his home with post rock. At the time he was working with the Kansas Highway Patrol and a colleague brought him a truckload of stone from central Kansas. Larry met Arthur while he was demonstrating post rock cutting at the Kansas Museum of History. Since their interests were similar, the two men struck up a friendship. Larry continued to see Arthur on an informal basis before the start of the apprenticeship. From Larry's point of view the apprenticeship was invaluable. The information Larry gained from working with Arthur could not be found in any other source. The knowledge of actually working the stone can only be found in the memories of post rock cutters like Arthur. There is no manual for cutting stone, instead there are individual preferences as Arthur points out. . . The apprenticeship opened many doors for Larry. Not only did he gain practical hands-on experience but he also shared in the traditional knowledge of a good many people he met traveling the back roads with Arthur. Unlike some other art forms that can be performed anywhere, Arthur and Larry had to travel to where the quarries were. As they traveled through central Kansas, Larry "picked" Arthur's brain. Arthur could look at a stone structure and explain how it had been built. Larry recalls a time when they were examining an abandoned quarry and found a broken fence post that had been repaired. The post would have been a mystery to the untrained eye but Arthur was able to look at the post and explain the repair. Larry was fascinated by the fact that someone took the time to repair the stone rather than simply replace it. It has become increasingly harder to obtain tools for cutting limestone the old way. Although there are modern tools that can help with the process, both Larry and Arthur prefer to cut the stone by hand. The old tools varied in form depending on the community from which they came. Stonecutters usually made do with what materials they had at hand and the knowledge of the local blacksmith. Today, Larry is calling on local blacksmiths to make his tools. Arthur enjoys passing his knowledge on to others. "I feel awful good about it because he [Larry] was so interested," says Arthur. "You know you've got to teacher a guy something that he wants to learn and is so interested in." The relationship between the two men continues to grow. Even after the apprenticeship ended Arthur and Larry continued to work together. Although Larry is now one of the younger men to share in the knowledge of this traditional skill he feels there always will be a certain amount of interest in post rock in Kansas. It is Larry's dream that he and Arthur can continue to quarry the native stone at least once a year. "I will continue to work with Arthur," Larry explains. "Arthur represents something that is precious in our society."